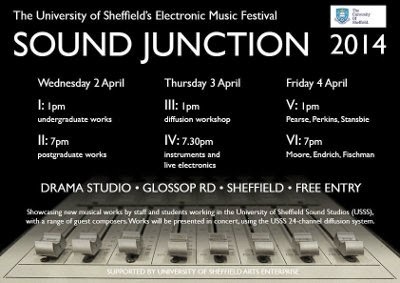 Sound Junction – The University of Sheffield’s electronic music festival – took place in early April. The 4-day event featured music by staff and students from Sheffield University, and a number of guest performers, including Rajmil Fischman, Archer Endrich, Rob Bentall, Dale Perkins, Louise Rossiter and various others. I performed Point of Departure on the Friday night.